The debate over the penny could have unexpected consequences for animals. What seems like a purely economic debate should be of interest to all humane-minded individuals....Perhaps if more people knew of the dangerous zinc inside their pennies, opinions would shift. Until then, animal advocates should take care to keep pennies in safe places. Sometimes animal advocates find themselves following issues that seem irrelevant to protecting animals. But seemingly innocuous debates can have far-reaching effects. Today, the debate over the penny could have unexpected consequences for animals. What seems like a purely economic debate should be of interest to all humane-minded individuals. In Washington, most opponents of the penny argue that the coins are near-worthless and minting them is a drain on the treasury. The arguments are valid, but our major concern is toxicity and environmental damage. Since 1983, pennies have been 97.5 percent zinc. They are only plated with copper. Zinc is a heavy metal and is highly toxic when ingested in penny-sized amounts. Companion animals have been poisoned and sometimes killed by ingesting pennies. Most often the victims are small dogs (only one penny is enough to kill a small dog), but cats and large birds are also at risk. Companion animals are the most likely affected, due to proximity, but wildlife can suffer, also. Birds and other animals may eat dropped pennies. The environment as a whole suffers from zinc mining and processing. The procedure leaks the toxic heavy metal in the air, soil, and even water. As a result, we all suffer. An overabundance of zinc in the environment can cause cramps, vomiting, skin irritation, and anemia in people. Zinc-polluted soil kills plants, eliminating the base of the food chain in affected habitats. Run-off pollutes water sources, creating a danger to aquatic life-forms and other animals and birds. Many people wish to keep the penny in circulation for nostalgia. Zinc miners support the penny for economic reasons. 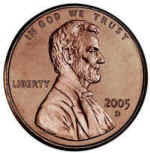 Perhaps if more people knew of the dangerous zinc inside their pennies, opinions would shift. Until then, animal advocates should take care to keep pennies in safe places.